"It's a family business, started in North Miami by my father, Jorge Sr.," said Jorge Alvarez Jr., who manages the Deerfield restaurant. "This is the food we grew up with, that our parents and grandparents brought from Cuba. However, we've found that most of our business is from other cultural groups. Once they try our cuisine, they're hooked." The prices are just as good as the meals. For lunch, you can choose from nine offerings, including shredded beef, roast pork, ground beef and their famous lamb shank. For dinner, you might choose a pork fillet simmering in a tangy tamarindo sauce or breaded fish that's broiled with a cilantro sauce. Little Havana skirt steak, prepared in a light parsley oil sauce. With each dinner, priced between $7.99 and $15.49, you get an individual loaf of home made, crusty Cuban bread. " A lot of people come here with the misconception that Cuban food is similar to Mexican food," Alvarez said. "Actually, there's very little in common. Mexico has a lot of regional dishes and some of them can be quite spicy. Cuban cooking doesn't blast your taste buds. The flavor comes from marinating and the combination of foods and spices." 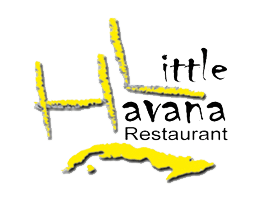 Little Havana has a full bar and a great Spanish sangria. Their wines come from Spain, Argentina and Chile, as well as the United States.